President Donald Trump hyped the drama surrounding his historic nuclear summit with North Korean leader Kim Jong Un Tuesday, tweeting hours before its 9 p.m. ET start that "we will all know soon" if a "real deal" is in the offing. In doing so, Trump diminished the importance of staff-level talks between the two nations that the White House had said "moved more quickly than expected" in recent days. Instead, Trump has placed his emphasis on the personal dynamics of the relationship he forges with Kim, whom American officials say will have to give up his nuclear arsenal and his ability to develop new weapons in order to get relief from crippling U.S. economic sanctions and assurances that the U.S. will not take military action against him. Before arriving here, Trump said it wouldn't take him long to gauge whether Kim is just looking for a photo-op or is willing to make the kinds of concessions that would end North Korea's decades of isolation. "I think within the first minute, I’ll know — just my touch, my feel," Trump said. The two leaders are expected to shake hands at 9 a.m., then sit down for a meeting at which the only other people in the room will be translators. After that, the schedule calls for a larger bilateral dialogue in which the U.S. will be represented by Secretary of State Mike Pompeo, White House chief of staff John Kelly and national security adviser John Bolton, followed by a working lunch. Pompeo and Bolton have played the good cop and bad cop roles in the administration's negotiations with Pyongyang. Pompeo has previously met with Kim and, as the nation's top diplomat, has a lot invested in striking a deal. Bolton raised eyebrows last month when he began openly discussing using a "Libya model" in negotiations with Kim. Meetings between staffs and representatives are going well and quickly....but in the end, that doesn’t matter. We will all know soon whether or not a real deal, unlike those of the past, can happen! When Bolton worked in President George W. Bush's administration, Libyan leader Muammar Gaddafi gave up his nuclear program under the threat of U.S. military action against him and the promise of sanctions relief. To that point, the parallel could be appealing to Kim. But Gaddafi ended up dead within a decade following a U.S.-led bombardment of his country. Bolton's use of the Libya phrasing, reiterated by Vice President Mike Pence in an interview, contributed to a tiff between the two nations and the brief cancellation of the summit. But it was quickly put back on track. 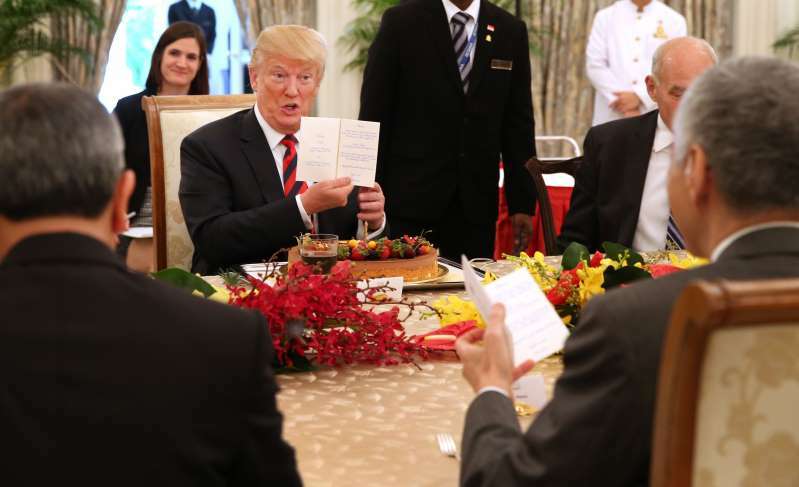 Trump is expected to wrap up a half-day of intense negotiations with a press conference before leaving Singapore Tuesday night to return to Washington. "The fact that I am having a meeting is a major loss for the U.S., say the haters & losers," Trump also tweeted shortly before the meeting . "We have our hostages, testing, research and all missle launches have stoped, and these pundits, who have called me wrong from the beginning, have nothing else they can say! We will be fine!"